The thing about Horror Hosts is that, as far as I know, every state in America has had one and each have meant something to their fans and viewers. For many, they feel like long lost friends who are guiding them through scary movies, and for others, they seem like the crazy uncle who does the zany stuff to get a laugh around the table during dinner. 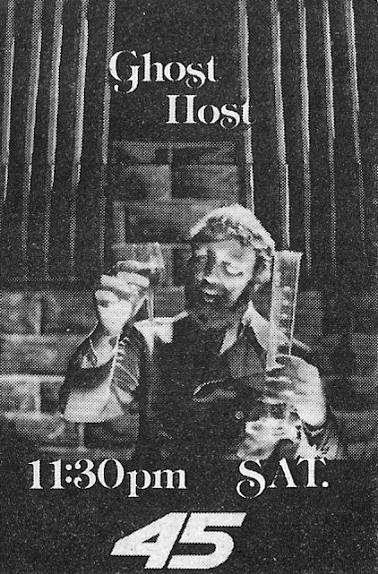 For Baltimore, Maryland and later Pittsburgh, Pennsylvania, one host that seemed to capture the attention of the viewers was a ghoul named Ghost Host who would stand in the shadows and host his show “Ghost Host Theatre” all the while calmly and creepily telling you about the night’s movie. Ghost Host was shadowed with mystery as his deep echoing voice would ring out and his face was covered by the darkness with only his sinister eyes peering into the viewer’s very soul! 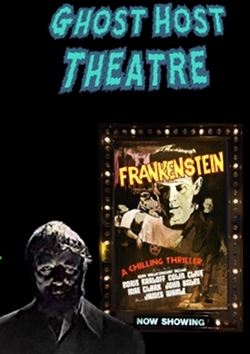 I first discovered an episode of Ghost Host many years back when cruising around a Horror Host trade site, and while I had always heard of him, it was via this trade site that I finally was able to view one of his shows as he hosted the Universal Frankenstein! And after watching this episode, I was hooked and I can see why Ghost Host has a loyal fan base. So I am very proud to bring you this update of Horror Host Icon: Ghost Host! Let’s travel to his mansion and discuss this creepy Horror Host. Ghost Host is a spirit in his dark mansion surrounded by woods with a rainstorm always raging outside during his show’s opening. Ghost Host wears a nice suit, has a beard and unkempt dirty hair, haunting dead eyes that stare into your soul, and a booming spooky voice that echoes. 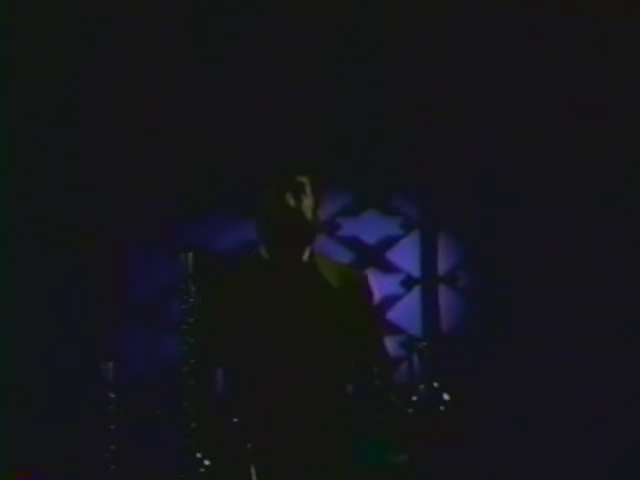 He also hides in the shadows and seems to enjoy telling the viewers about the night’s movie, and he does so with class. Besides being a spirit, Ghost Host also seems to like to do experiments in the Mansion’s dungeon as well as take strolls in the cemetery that is on the grounds of his property. Ghost Host seemed to take joy in having the viewers as his guests and took pride in introducing the evening’s movies as he would treat them with respect. He also enjoyed sharing info on the actors and makers of the film or films he was hosting. Ghost Host was not your typical Horror Host as he was not one to incorporate comedy skits or deliver cheesy jokes. Instead he went the more direct, semi scary route to help add to the chills of the viewers making Ghost Host live up to his name! His quote that he would say in order to close his show was this “Here’s Blood In Your Eye” as he would take a drink of some unknown weird liquid he made. 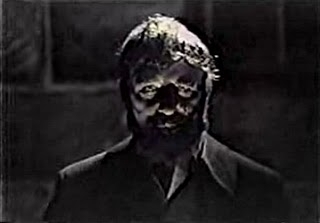 Ghost Host scared viewers on his show “Ghost Host Theatre” from 1971-1985 and ran in many markets from Maryland to Pennsylvania and became a must watch for many of Monster Kids. 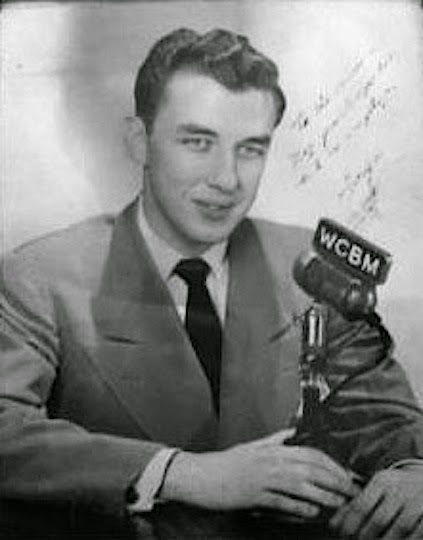 George Lewis was the man behind Ghost Host and was a TV Personality for WBFF out of Baltimore. 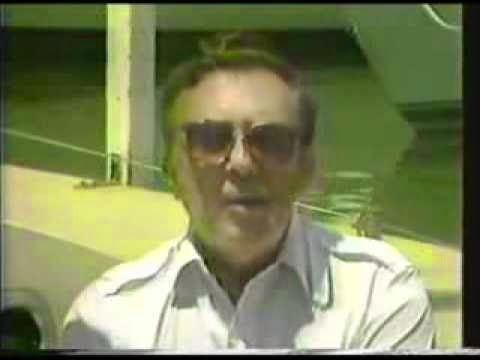 He started his time as a TV host in 1957 as the host of a kids show called “Steamboat Bill and Mr. Cartoon” that ran until 1970 on WSAZ-TV out of West Virginia. George started his major TV career in 1971 on WBFF Channel 45 in Baltimore, Maryland when he played Captain Chesapeake, a kids show host who was super popular and ran all the way until 1990. 1971 also started his run as Ghost Host a late night horror host for WBFF, and he also delivered news for the station! During his time as Ghost Host, his show was also picked up in Pittsburgh, and the character gained more followers and acted as a gateway for youngsters to wait for Chiller or other shows that introduced them to the classic monsters. 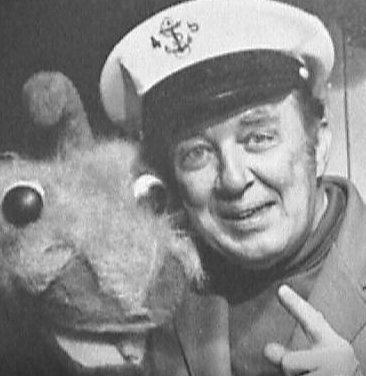 In 1990, after Captain Chesapeake went off the air, George retired from on-air roles and spent his remaining days enjoying life and spending time with family and friends. Sadly, George Lewis passed away on December 18, 2000, and while he is gone, the mark he made on kids of the 70s-80’s is still felt and his memory will always live on. I want to also note that George Lewis produced another Horror Host called Gaylord, who was a returning host from the 50’s who got a new show in Maryland in the 70’s! While Ghost Host was a very popular host, it is clear that his time as Captain Chesapeake is what most watchers from Baltimore remember him best for. I first heard of Ghost Host around the late 90’s thanks to old horror magazines and an old black and white image they printed of him. Some years would pass and thanks to Horror Host show traders, I was able to get my hands on a few episodes and found myself hooked as the atmosphere of the show was top notch! The thing that did throw me off was the fact that the shots used for the show were used episode after episode and only the voice over would change as Ghost Host was really in the video just reciting Hamlet! I heard they went the route of reusing footage to save money on tapes and also that one night The Ghost Host was a little drunk on live air and it made for a crazy and enjoyable watch for viewers. But keep in mind, him being drunk on air is a Horror Host Urban Legend, and it has never been proven as fact. While looking up information about Ghost Host, the one thing I found interesting is that while he was very popular in Maryland, he was not as favored in Pennsylvania (but still liked) as many of the viewers would only tune into him before their favorite shows,like SNL or before Chiller Theater, would hit the late night airwaves. The thing about Ghost Host and his show is that it very much had a cheap look and feel to it making it a true Horror Host show on a budget, but while he might not have had a huge production budget, he did have a great spooky over all feel and look to the show and I really dig the creepy music that was played during his segments as well like his intro song and credits very much. Did you know that in 2016 Ghost Host was inducted into the official Horror Host Hall Of Fame and finally took his place alongside the immortals of the hosting genre? What he lacked in budget, he made up for in atmosphere and character and that’s why Ghost Host is one of the all time greats to this Horror Host fan. Most of the time, Horror Hosts feel like your friends who wait for you to join them at their home or base and watch a scary movie all the while they get into some sort of silly adventure with hosts like Commander USA, Dr. Creep, The Creeper and Grandpa Munster all had this quality about them. Ghost Host however does not have the friend feel and has more of a crazy old man who lives in the big run down house at the end of the street that never mows his lawn and the parents of the neighborhood dislike and the kids all share stories of how he has the bodies of missing kids in his basement…in other words, he seems sinister, crazy and spooky, and while a ghost, he sure does love to do experiments and stroll in his graveyard. This is just something I felt I should point out about him as I enjoy his show very much and like this aspect of him as it’s very different from most hosts of his time. Oh and I also love that his mansion is a painting and that the graveyard is clearly a set with cardboard tombstones with names of famous monsters misspelled on them, classic Horror Host stuff! So we are at the point of looking at the Ghost Host Theater episodes I own, and most, if not all, of them are from his Double Feature show taped off TV from Maryland, and these are all the ones I have been able to collect over the years and want to thank all the Horror Host Trade Lists for having these available for me to watch and now review here on my Horror Host Icon update to honor Ghost Host. I do not give these episodes a star rating and the host segments are written by me with the films coming from our pals at IMDB. So sit back and take a trip to the Ghost Host mansion and see what horrors he has in store for us! Host: Ghost Host is standing looking out the window of the mansion looking out at the rain and ushers us into the first part of the night’s film. 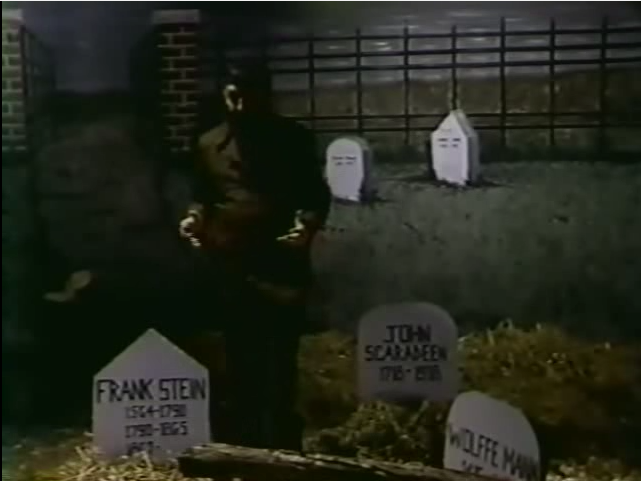 The Ghost Host is now walking around his graveyard and tells viewers what will be coming soon to his show as well as that his second film of the night is “Captive Wild Women” and goes back to the first film. 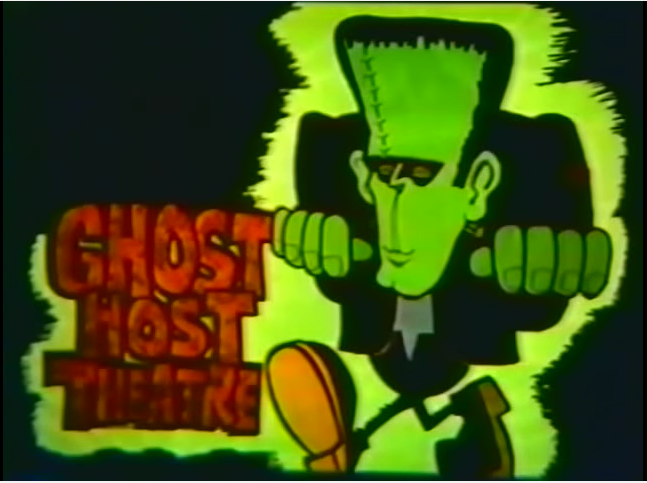 And we are treated to lots of Ghost Host name logo bumpers before we join him once more in the graveyard, and as he is telling us about the second film, this DVD cuts off and we miss his bumper and the second film! 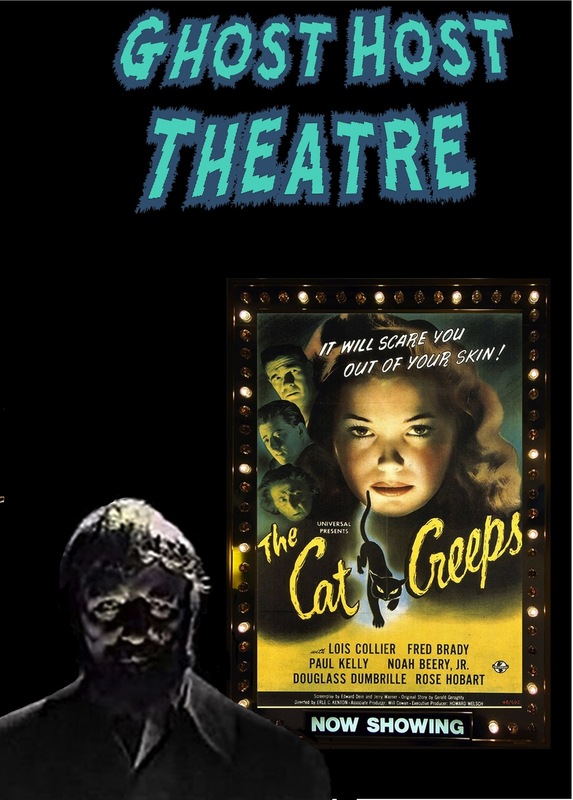 Movie: A black cat is suspected of being possessed by the spirit of an elderly murdered woman. Note from Matt: It appears this was part of a double feature showing, so not a full episode and the commercials have been cut out. Host: Ghost Host is standing looking out the window of the mansion looking out at the rain and then walks over to his desk and starts to mix potions and tells us the first film of the night is Frankenstein and then slowly takes us into the first part of the movie. We next join Ghost Host in the graveyard, where two bodies are laying and have clearly been murdered, and he tells us that the second film of the day will be “Ghost Of Frankenstein.” He steals a ring off the dead female body and ushers us back to the film as he sits with the dead. We get lots more Ghost Host logo bumpers and no end segment or second film. Movie: Henry Frankenstein is a doctor who is trying to discover a way to make the dead walk. He succeeds and creates a monster that has to deal with living again. Note from Matt: This was part of a double feature showing, so not a full episode with all segments. Host: This episode starts with a jump cut from the opening credits and has Ghost Host wandering around the graveyard. 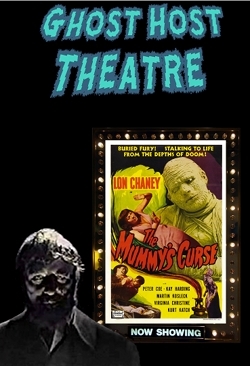 He tells us a little about who stars in the film we are about to see, The Mummy’s Ghost! The next time we see Ghost Host, he is closing the show, mixing a drink and giving us his closing line “Here’s Blood In Your Eye”. Movie: An irrigation project in the rural bayous of Louisiana unearths living mummy Kharis, who was buried in quicksand twenty-five years earlier. Note from Matt: This was part of a double feature showing, so not a full episode with all segments and to boot it’s the second film shown of said double feature. This also seems like a very poorly edited episode from the person pausing for commercials as most logo bumpers are missing as are most of The Ghost Host skits. Host: Ghost Host is standing looking out the window of the mansion looking out at the rain and then walks over to his desk and starts to mix potions and tells us the film of the night is Night Key and then takes us into the first part of the movie. 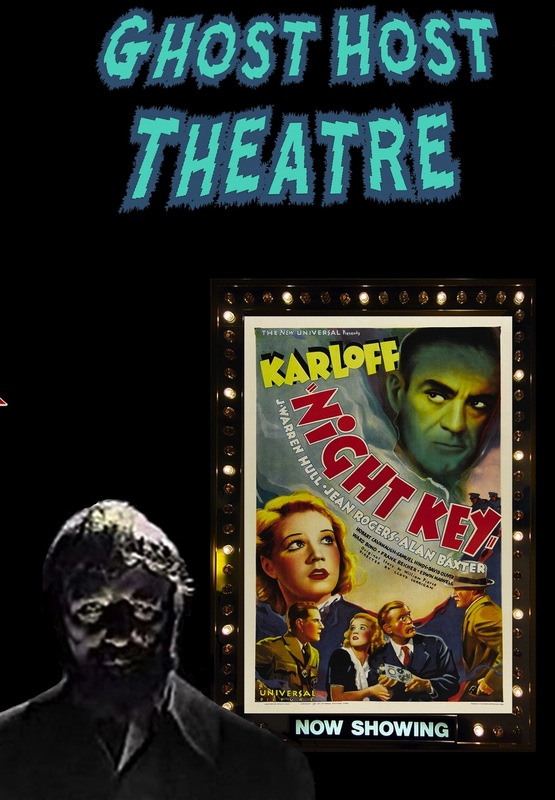 We next see Ghost Host walking around his graveyard, and he chats about 30’s horror films that they will be showing soon on his show and then takes us back to the night’s film. We next join Ghost Host in his lab once more working on an experiment, and he tells us what’s in store for us next week! Movie: The inventor of a new top-of-the-line burglar alarm system is kidnapped by a gang in order to get him to help them commit robberies. Note from Matt: Sadly this episode is missing the end segment as well as end credits. Host: Ghost Host is standing looking out the window of the mansion looking out at the rain and then walks over to his desk and starts to mix potions and tells us the film of the night is Werewolf Of London and then slowly takes us into the first part of the movie as he continues to work on his experiment. We next see Ghost Host walking around his graveyard and hypes some upcoming films he will be hosting in the coming weeks like The Mummy and Night Monster and has a sinister chuckle about the viewer being scared over the night’s movie. 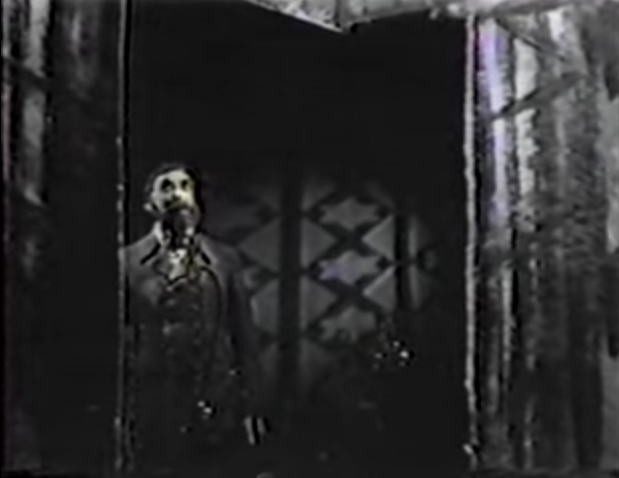 The Ghost Host ends the show by inviting us back next week and delivers the line “Here’s Blood In Your Eye” as he takes a drink and the rainstorm still rages on outside. Movie: While on a botanical expedition in Tibet Dr. Wilfred Glendon is attacked in the dark by a strange animal. 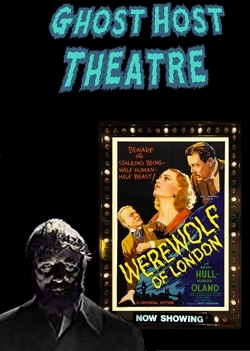 Returning to London, he finds himself turning nightly into a werewolf and terrorizing the city, with the only hope for curing his affliction a rare Asian flower. Host: Ghost Host is standing looking out the window of the mansion looking out at the rain and then walks over to his desk and starts to mix potions and tells us the first film of the night is Invisible Ray and then quickly takes us into the first part of the movie as he continues to work on his experiment. We next see Ghost Host walking around his graveyard and hypes the second film of the night and just chills standing next to a tombstone while we go back to the movie. We return to Ghost Host and he is still in his graveyard, and we just hear his voice at first and then he appears and takes us to the second film. Once more in the graveyard Ghost Host tells us about upcoming film he will be showing very soon on his show and then quickly we get a Ghost Host logo bumper. The end segment seems to be missing. Movies: The Invisible Ray – Visionary scientist Janos Rukh convinces a group of scientists and supporters to mount an expedition to the African continent to locate and study an ancient meteorite of great significance. 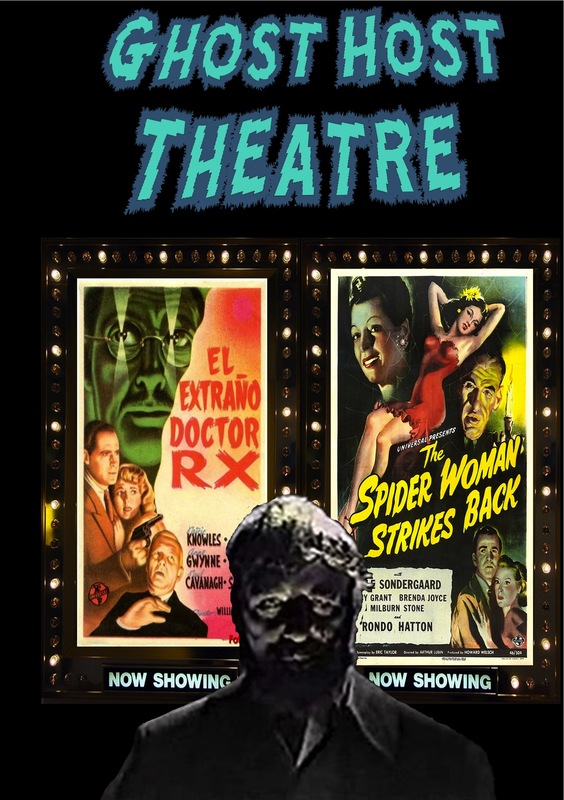 He exposes himself to the highly toxic radiation of the meteorite, and while an antidote devised by Dr. Benet saves him from death by radiation poisoning, his naked touch causes instant death to others. Back in London, the benefits of the meteorite’s controlled radiation offer Dr. Benet an opportunity to restore eyesight to the blind. The antidote’s toxicity excites Prof. Rukh into paranoid rages as he seeks revenge against the members of his expedition, who he accuses of stealing his discovery for their own glory. 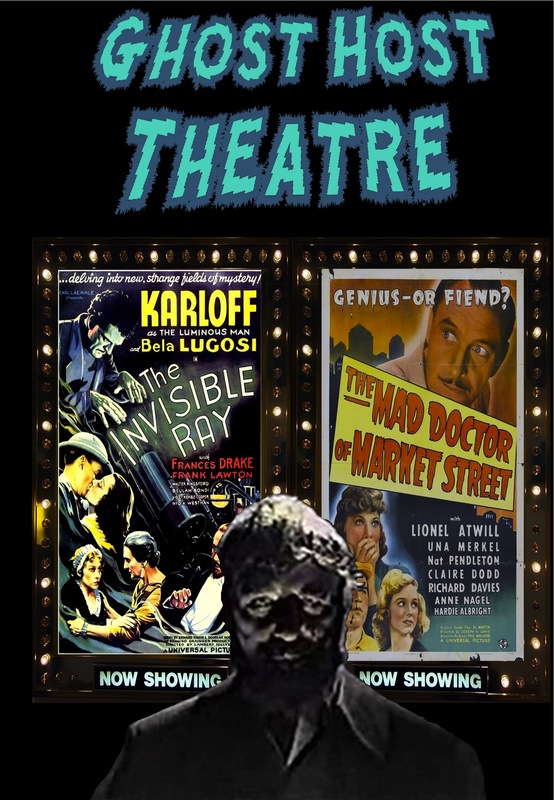 The Mad Doctor Of Market Street – A mad scientist is forced to leave San Francisco when his experiments become known. He lands on a tropical island, takes control and terrorizes the local populace. The survivor of a shipwreck washes ashore on the island, sees what is happening and determines to free the natives from his rule. Note from Matt: Sad to say this episode has lots of digital breakup as the person I got it from put it on a very cheap DVD-R, and this made it very hard to see the ending of the film and episodes closing segment that appears to have been cut off. Host: Ghost Host is standing looking out the window of the mansion looking out at the rain and then walks over to his desk and tells us the film of the night is Doctor RX and then super quickly we go to the first part of the film. We next see Ghost Host walking around his graveyard and hypes the films coming soon to his show and just stands around before we go back to the film. We come back to Ghost Host who is in his mansion and ends the show with his famous like “Here’s Blood In Your Eye”! Movies: Doctor RX – A monster lurks as New York newspaperman Lee Taylor investigates one of the “Moon Killer” murders, in which the victims are strangled, cannibalized and surgically incised under the light of the full moon. The trail leads to the cliffside mansion of Dr. Xavier, where the doctor and his colleagues conduct a strange experiment. The Spider Woman Strikes Back – Jean takes the job of caretaker/companion (before the word took on a completely alternate-life style meaning) to blind woman Zenobia. Also hanging around the house, in this horror/western, is Mario, a deaf-mute servant who evidently wasn’t much help to Zenobia when it came to identifying the source of a noise Zenobia couldn’t see. Jean is a little slow in realizing that Zenobia is slowly killing her by taking her blood. Nothing personal. Zenobia needs her blood to feed some plants. She uses the blossoms of the plants to make poison to kill cattle in order to drive away the local ranchers so she can buy all the land…cheap. Note from Matt: The second film on this disc is clearly a crappy put together fan reproduction or just a goof from the station as the breaks for Spider Woman Strikes back are those of Doctor RX! 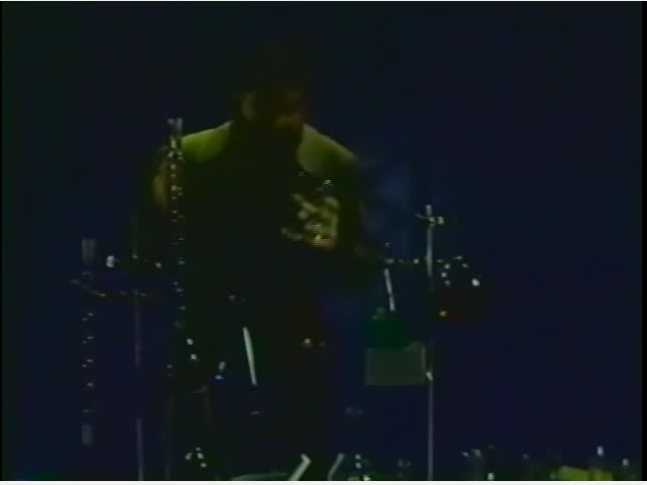 While Ghost Host’s footage from episode to episode only changed slightly and the voice over sometimes was hard to understand from the echo and music playing over it, to this day I find him to be a great Horror Host whose look and style was all his own and his spooky echoing voice is captivating and draws you into every word he is speaking. 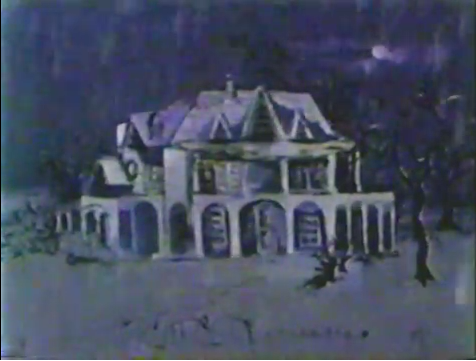 Also while his show has been off the air for decades, I like to think his old mansion is still out there crumbling as the constant rainstorm batters it and that The Ghost Host is still inside working on his experiments and taking breaks from it by strolling around the rundown graveyard and still watching black and white horror movies for enjoyment. I am as always interested in getting more episodes of Ghost Host so if you, my friends and readers, have some feel free to send me a message and we trade or something. I also would love to hear from you guys about what Horror Hosts you would like to see me cover here at Rotten Ink and give the old Horror Host Icon treatment to. I always love learning about new hosts and enjoy seeing what joy they brought to their viewers. So to wrap up this update I want to say a big THANK YOU to Ghost Host who was an amazing Host with such a simple low budget show. Our next update will take us away from the world of Horror Hosting and into the world of aliens as I will be delivering another “Alien Invasion” update that will cover the DC Comic adaptation of the movie Alien Nation! So until next time, read a comic or three, watch a Horror Movie or two and as always support your local Horror Host! See you back here for the next update.